Beyer Projects | Julian Opie - Garage? Garage?, by Julian Opie, is an abstracted, archetypal rendition of a detached garage. 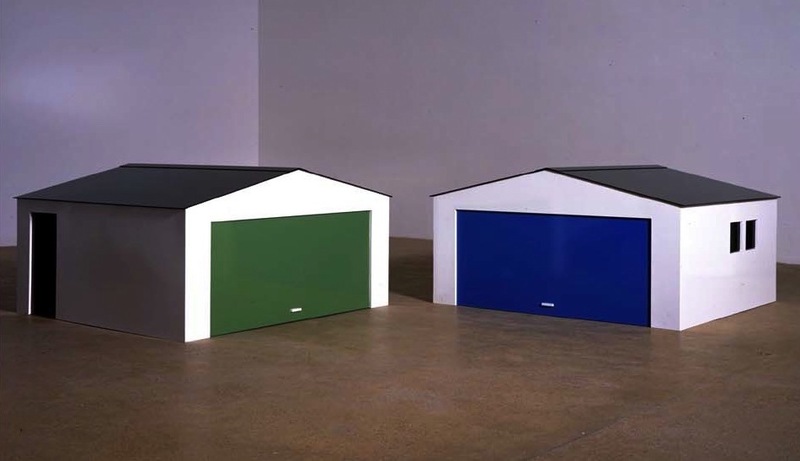 The edition was published as a series of 8 sculptures, with each garage door painted a different color. Garage? is a domestic-scaled sculpture, fabricated in aluminum plate using automotive industry technologies before being fastidiously hand-painted. Julian Opie (b. 1958, London) studied at Goldsmiths College of Art from 1979 to 1982, and had his first one person exhibition in 1983. Since then, Opie has had exhibitions at the Museum of Contemporary Art in Chicago, the Institute of Contemporary Art in Boston, and additional galleries and public spaces throughout Europe and the United States. Please contact Beyer Projects regarding availability of this work.